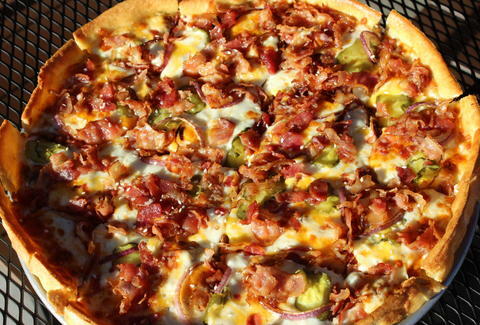 What's the point of eating a boring old bacon cheeseburger when you could instead be eating a bacon cheeseburger on a pizza? 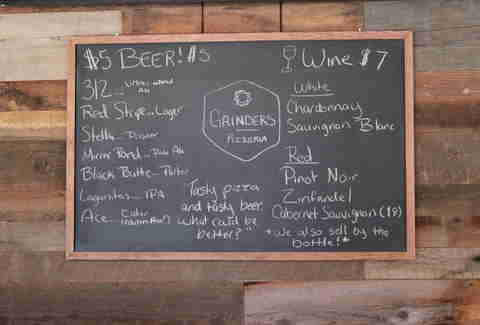 You read that right, Grinders Pizzeria, a new neighborhood joint in the Inner Richmond, is taking popular grinder sandwiches and reassembling their ingredients onto pizzas. The bacon cheeseburger has a ketchup/mustard mix, pickles, extra ground beef, onions, bacon, and cheddar, and it's topped with sesame seeds for that perfect finishing touch. The concept was created by Joe Irick, a former pizza critic of The Chicago Tribune, and his wife Amanda, but don't worry -- not everything on the menu requires an open mind. Grinders definitely has all of your favorites as well. The neighborhood spot has outdoor seating and a few tables inside, along with a small bar. If you don't feel like leaving the house, you can order delivery using GrubHub or Eat24 as long as you live in the area. The California Thin Crust pizzas range in price from $14.99 for a 10in to $23.99 for a 16in. Some of the more adventurous options include taco toppings, the Reuben, and the Buffalo chicken, but you can also order your favorites like a Margherita or a Supreme (tomato sauce, sausage, pepperoni, mushrooms, bell peppers, onions, black olives). 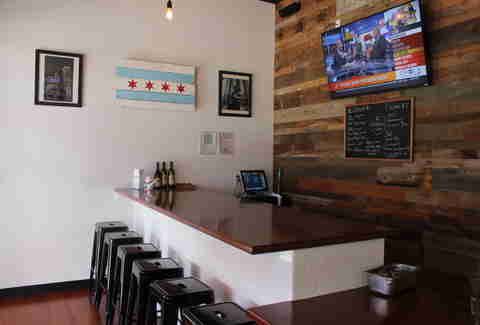 Grinders has three flat-screen TVs, so feel free to get comfy and enjoy the game. While the staff doesn't play the sound for every game, they'll always have it on for big games and playoffs. Beer is only FIVE dollars (what?) and Chicago transplants will be stoked to know it has Goose Island's 312 Urban Wheat Ale. Even better? Every beer comes with a Grinders coozie. 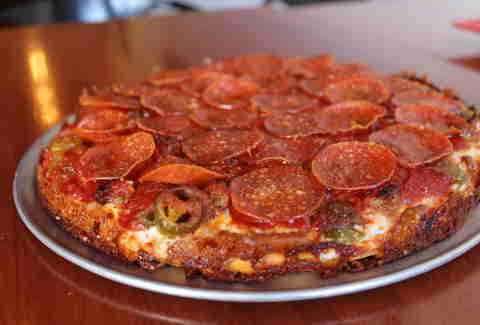 You'll also want to try the Chicago Pan Crust pizza featuring Grinders' signature caramelized cheese crust. 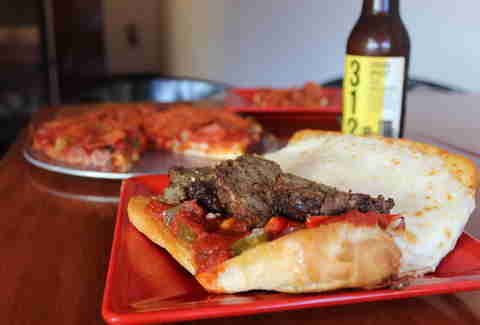 No, this isn't your traditional Chicago-style deep dish, but who wants to eat like those fatties anyway? (Okay, we kind of do, but we also want our pants to fit.) 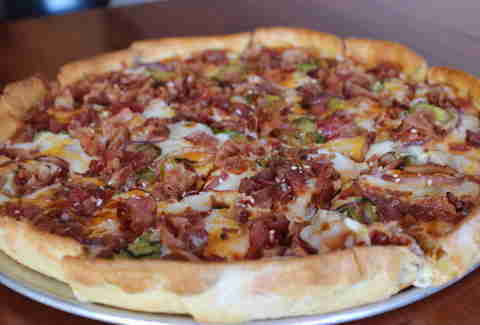 Order one with hot giardiniera... unless you think you can't handle the heat. What is hot giardiniera? Don't worry, we had to ask as well. It's a spicy pepper mixture that originated in Italy and is apparently super-hard to find in SF. There's a mixture of pickled Serrano peppers, celery, bell peppers, and pitted green olives, and it's preserved in soybean oil for at least 30 days. Whatever it is, it's damn good and we're officially converts. 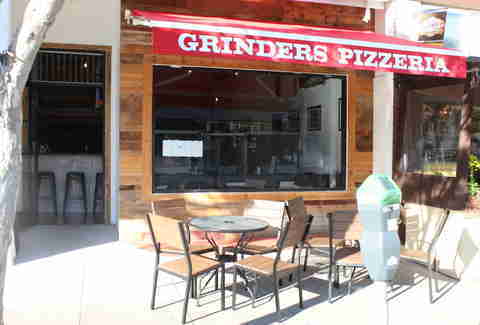 Grinders also offers non-pizza-fied grinders, which probably need an explanation since we don't really have those in SF (UNTIL NOW!). A grinder is an oven-baked sandwich on a soft French roll that's super popular back East. It's then brushed with garlic butter and topped with mozzarella cheese. Warning: if you eat the meatball grinder once, you will crave it for the rest of your life. If you're feeling healthy, ignore that feeling and still order the meatball grinder. Or FINE, one of the yummy salads. On the not-so-healthy-but-who-cares side, Grinders also has a build-your-own mac & cheese starter, which is probably something you should do once or 29 times. Basically, just go to Grinders and order something -- anything. It's that damn good. Daisy Barringer is Thrillist's SF Editor and she wasn't kidding about the meatball sandwich. In fact, she's probably going to turn this article in and order one right now. Follow her on Twitter @daisy for more of her thoughts about meat and balls.